The number of children fleeing violence by themselves to the United States from Honduras, Guatemala, and El Salvador has skyrocketed over the past few months. No less than 47,017 children have arrived so far in 2014—a 92 percent increase from 2013—and as many as 90,000 children are expected by year’s end. These children are escaping danger in their homelands and running for safety not only to the United States, but also to neighboring nations including Panama, Belize, and Costa Rica. As attention on this issue shifts from the nation’s southern border to inside the Beltway, it’s important to keep the following five facts in mind. Interviewing more than 400 unaccompanied minors, researchers found that many of them had fled forcible ‘join or die’ gang recruitment or gang threats against themselves and their families. According to the U.N. High Commissioner for Refugees, or UNHCR, 58 percent of unaccompanied minors “raise potential international protection” claims. This means that they have a viable claim to refugee protections under international law. The demographics of the children entering the United States have changed dramatically. For much of the past decade, most of the children crossing the border were older males. But many of those arriving now are female and the average age is dropping: Children under age 10—and some much younger—are now making the dangerous journey from their homelands. Even worse, smugglers and human traffickers are taking advantage of the crisis by enticing children who are looking for a way to escape the violence to flee by acting as transportation from the home country to the United States. These people are often related to—or working in concert with—the same groups perpetrating the violence within the children’s home countries. Girls are routinely raped on the journey and gang violence along the route is common. While some of these children do have relatives in the United States, reuniting with family was the primary goal for less than one-third according to researcher Elizabeth Kennedy. Instead, violence forced them from their hometowns and home countries. The violence currently rocking Honduras, El Salvador, and Guatemala is not only causing a refugee crisis in the United States. Every country in the region has also been affected as children are running for their lives and seeking safety wherever they can find it. According to the UNHCR, asylum requests from Honduran, El Salvadoran, and Guatemalan nationals have increased 712 percent in the neighboring nations of Mexico, Panama, Nicaragua, Costa Rica, and Belize since 2009. It is important to understand that no law or program protects unaccompanied minors from being sent back to their home countries. Even if they are released to a family member or sponsor to wait for an immigration hearing, every child who arrives in the United States is put into deportation proceedings. They are not given a green card or granted any kind of legal status. Generally, U.S. Customs and Border Protection, or CBP, encounters unaccompanied minors upon a child’s arrival. CBP agents are required by law to turn children over to the Office of Refugee Resettlement, or ORR, within 72 hours. ORR is then tasked with caring for them and releasing them to family members or sponsors. But ORR is already overstretched and it has been scrambling to find adequate shelter space to accommodate the increasing number of children. 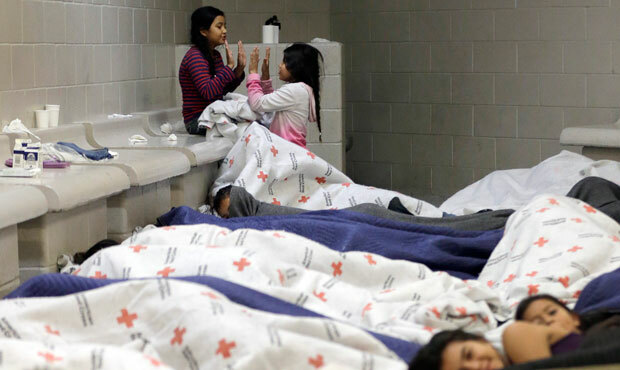 The agency opened a shelter at Lackland Air Force Base in San Antonio, Texas, that can hold up to 1,200 children and plans to open two more—one at a naval base in Ventura, California and another at Oklahoma’s Fort Sill. ORR is working to move unaccompanied minors out of temporary housing. Currently, these children have an average stay of 45 days in shelter care. Once released, ORR estimates that it places 90 percent of children with a family member or friend, reuniting 30 percent with a parent. Two weeks ago, President Barack Obama announced that the Federal Emergency Management Agency would coordinate the government’s response to this crisis. The administration has asked for an additional $1.4 billion in funding for fiscal year 2015—for a total budget of $2.3 billion—in anticipation of continued need. With House Republican leadership looking for any excuse to block immigration reform, the children fleeing the violent crisis have been a prime target for political opportunism. Sen. Ted Cruz (R-TX) argued at a recent Senate Judiciary Committee hearing that “the numbers [of unaccompanied children] spike[d] dramatically” after President Obama created the Deferred Action for Childhood Arrivals, or DACA, program in 2012. DACA gives temporary legal status and work authorization to eligible unauthorized youth. But this assertion could not be further from the truth. The uptick in the number of children fleeing for their lives began well before DACA’s creation and has been due solely to their exodus from the violence-stricken countries of El Salvador, Guatemala, and Honduras. The number of unaccompanied children arriving from Mexico, for example, has not increased. Likewise, DACA—and any version of immigration reform currently under consideration, including the Senate-passed S. 744—would only apply to people who have been in the country for a number of years. It is clear that some misinformation regarding the ability to stay in the United States has spurred the arrival of those looking to flee the violence in their home countries, but lax border security—given the sharp increase in immigration enforcement and the money the United States has spent on it over the past few years—is not causing these children to attempt such a dangerous journey. The administration must ensure that children are released from ORR custody into safe environments—preferably to a family member, not to someone who might do them harm. Likewise, it is critical to ensure that these children have access to counsel as they move through the immigration system. There is no guaranteed right to counsel in immigration law, even for children. The Obama administration has just announced a new program to bring 100 lawyers and paralegals to wherever they are needed in order to provide counsel for unaccompanied minors. While is a good first step, many more lawyers will be needed to truly address the scope of the problem. Passing immigration reform would also help mitigate the crisis by clearing the backlog of people waiting for visas and allowing parents in the United States to sponsor their children to immigrate legally. The government must also crack down on smugglers and traffickers by using immigration enforcement resources to identify and apprehend those that are exploiting unaccompanied minors. We must support efforts in the sending countries to reintegrate those children that return to their home countries and to mitigate the dangers that are forcing children to flee in the first place. With members of Congress already looking for ways to manage the flow of refugees entering the country, the United States must ensure that any and all solutions focus on protecting the children who make the journey. Ending a humanitarian crisis rooted in gang violence, human trafficking, and weakened economies in multiple Central American countries will not be easy or quick, but dealing with unaccompanied minors in a humane way should be our primary goal. Philip E. Wolgin is a Senior Policy Analyst for Immigration at the Center for American Progress. Angela Maria Kelley is the Vice President for Immigration Policy at the Center.